So I got to thinking about other favorite songs when I was a tyke. 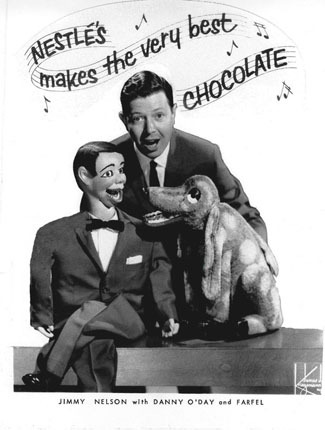 The Nestle’s chocolate song sung by Farfel, the puppet dog, was a definite fave. I loved it when he clapped his jaws shut at the end–who didn’t? And I remember my Aunt Kat playing Elvis 45s downstairs in my grandparents’ apartment and really liking “Hound Dog.” (“You ain’t nothing but a hound dog, cryin’ all the time…”) But the two songs that stand out in my mind are “Love and Marriage” and “High Hopes,” both sung by Frank Sinatra. While most kids my age were heavily into whatever they were hearing on Ding Dong School, I was grooving to Old Blue Eyes. Just imagine him singing those catchy ditties in the studio–sharp suit, tie loosened, fedora tipped back, cigarette going, glass of Jack Daniels in his hand, one take and out. Not exactly squeaky-clean Raffi. Now you have to understand that in Italian-American households back then, there were usually three portraits hanging in a cluster in every kitchen: Jesus, JFK, and Frankie. Jesus for obvious reasons, though sometimes a picture of the sitting Pope served as a stand-in. John F. Kennedy because he was the first (and only) Roman Catholic President of the United States. And Sinatra because there’s no other like him, a Manichean embodiment of soaring talent and bad-boy swagger. 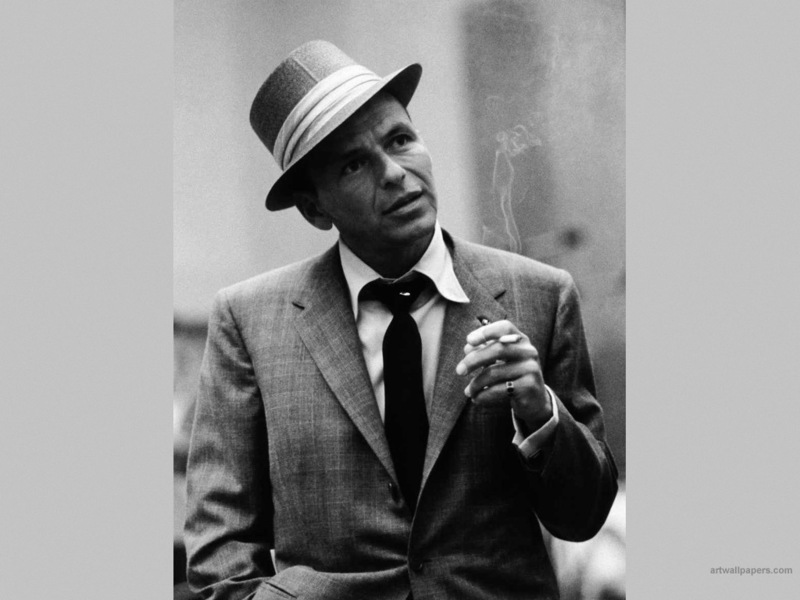 In my world you weren’t allowed to merely prefer Sinatra, you had to like Sinatra. His picture looked at me whenever I sat at my grandparents’ kitchen table, staring through the rising steam of Grandma’s gravy pot. He got into my pores and seeped into my consciousness. The guy with the golden pipes, the phrasing that spoke to you and only you, the man who hung out with mob bosses and chased down the Manchurian Candidate, the lucky fella who seemed to have every luscious Hollywood piece of tail he wanted without even trying. Screw Ding Dong School. I was into ring-a-ding-ding.